Training camp is starting, but the Tennessee Titans still haven’t signed Marcus Mariota to his rookie contract. Why? Offset language. The term offset language might a bit confusing. In short, it suggests that if Mariota is released by the Titans and signs with another team, they have the right to get back some of the guaranteed money from their quarterback. Right now, this is what’s stopping them from coming to terms on a deal that’s set in stone in terms of years and money. According to interim CEO and president Steve Underwood, the Titans don’t feel pressured because of the training camp date looming, and don’t plan on backing down from their demand, finding it substantial not just in Mariota’s case, but also as a guideline for future contracts. We’ve always had offset language in our player contracts. It’s nothing new. I think it is important where a high first-round draft pick is concerned, because it’s the precedent. Everything that we do is precedential for the next round of contracts. So keeping the offset in place is something we want to be able to do going forward. And the minute you back away from the contract principle then you no longer are able to assert it going forward. Whatever you do echoes into eternity with player contracts. We just can’t afford to take a step back, at least this early in the process. We’re still a couple of weeks away from training camp. There are two weeks between now and the beginning of training camp (July 30). Underwood said it’s equally important to get the team’s hopeful franchise quarterback signed and keep their principles and stand in tact. The offset language is probably the last remaining obstacle in this negotiation, with Mariota’s off-the-field activities like surfing no longer being a problem. 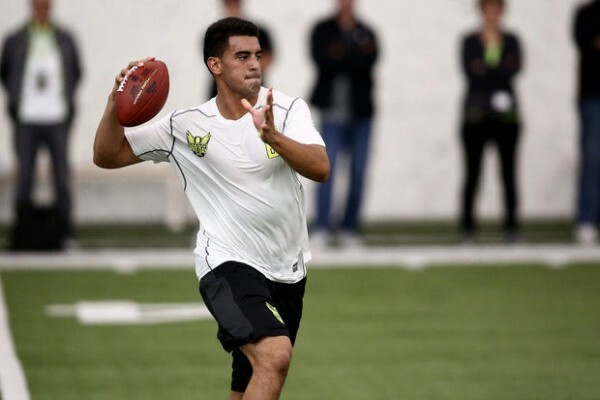 There’s been talk about some conspiracy and plan between Mariota and Philadelphia Eagles head coach Chip Kelly to make themselves meet at some point, and hopeful as soon as possible as far as they are concerned, in the NFL. Maybe Mariota is counting on the Titans releasing him at some point, which will give him the opportunity to join the Eagles. Or maybe, he’s simply being realistic and careful about how things work out in the NFL, and doesn’t want to lose any money that might be coming his way.